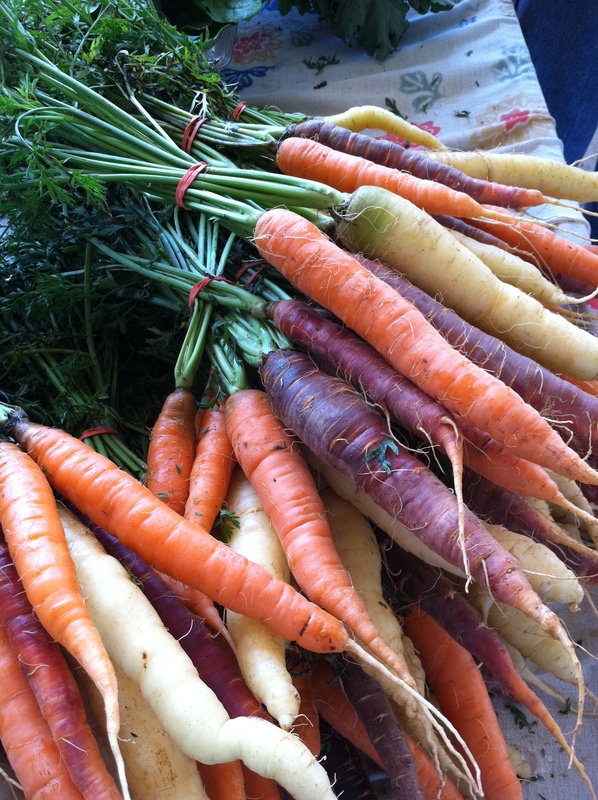 Local, sustainable, organic, the buzz words of foodies everywhere. Do we really know where our food comes from? How does it end up on our plates? Who are the people that actually grow our food? 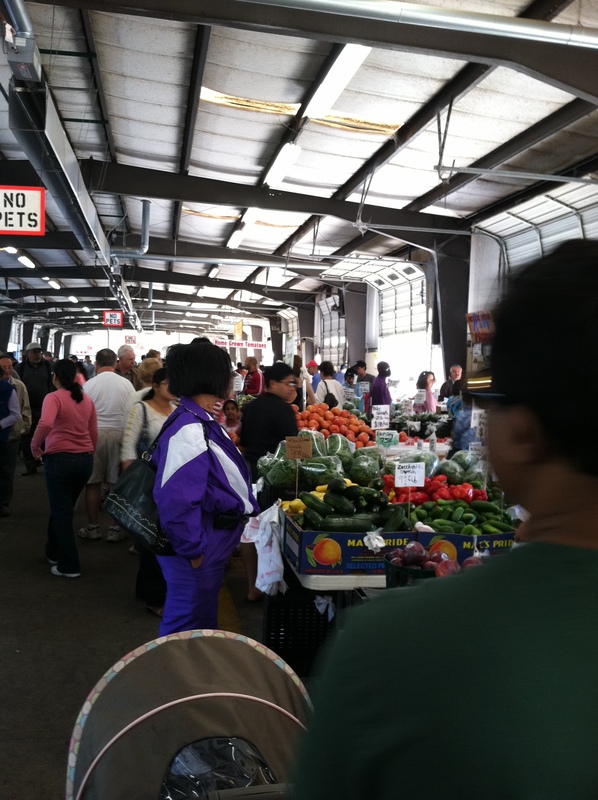 I decided to do to the big farmer’s market here in Charlotte to find out. Charlotte has many small markets that pop up all over town on different days of the week. There is a popular one just a few blocks down the street from the house and then there is another HUGE one out by the airport. That’s where I went; The Charlotte Regional Farmers Market on Yorkmont Road. The market opens at dawn on Saturdays. Every time I was there before, there were always treasures. Today was no different. I bought a bounty of goodies. 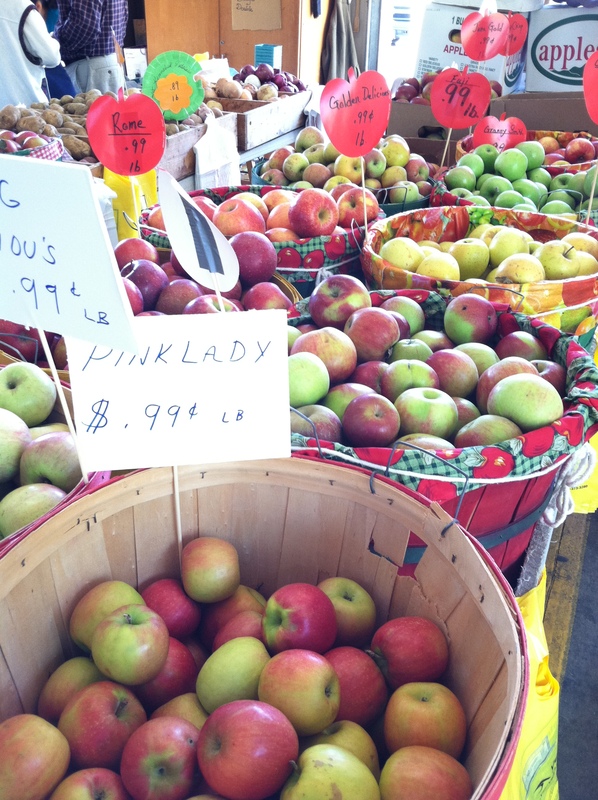 French red sparkler radishes, aromatic peaches, crisp rainbow Swiss chard, pink lady apples, yummy corn relish and more. 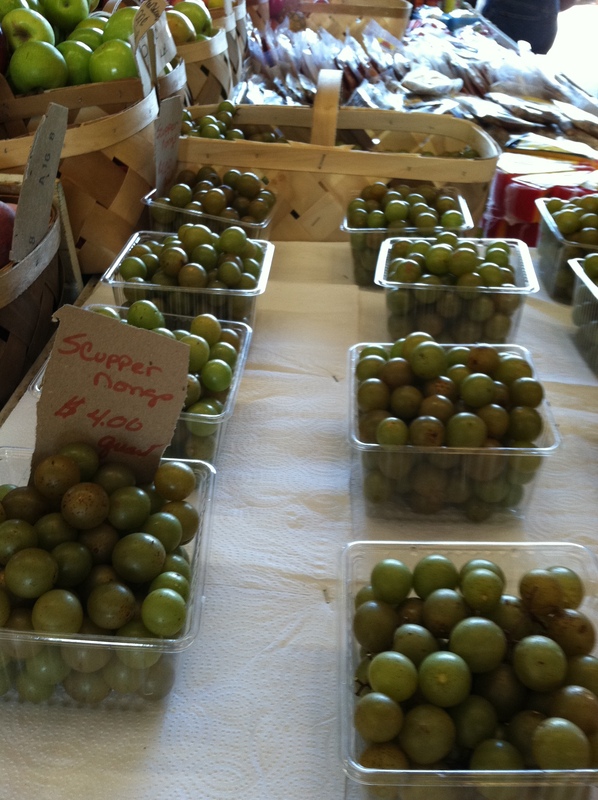 The air was filled with the heady scent of scuppernong and muscadine grapes. I think they are like eating eyeballs, but of course much more flavorful. You bite the skin open and squeeze the grape’s insides into your mouth then discard the skin and the single seed inside. The flavor is sweet, rich, full and totally unique to these grapes. Everyone should try them sometime. I met a delightful, energetic lady who keeps herself quite busy with all the tempting relishes, pickles and treats she makes and sells at the market. Miss Virginia has been selling her wares at this market for over 8 years. I will have to visit Virginia again for another of her creations as well as to get her information. Be sure to buy yourself something when you visit Virginia at the market. Her corn relish was great with the grilled chicken we had for dinner. . . wait until you hear about our dinner! 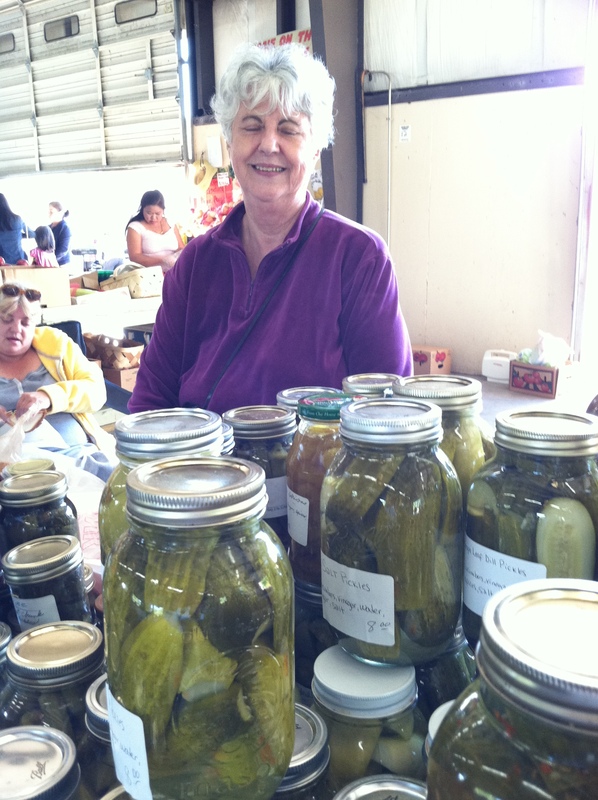 She told me about her grape leaf dill pickles, which she claims is her best seller. I asked about the grape leaf and Virginia says it makes the pickles really crispy. Virginia has written her most popular and favorite recipes in a cookbook which she sells at her booth in the market. I enjoyed talking to someone who obviously enjoys the condiment world as much as I do. In fact she inspired me to buy some pickling cucumbers to put up some more before the season is gone. I’ll be making the half sour pickles. 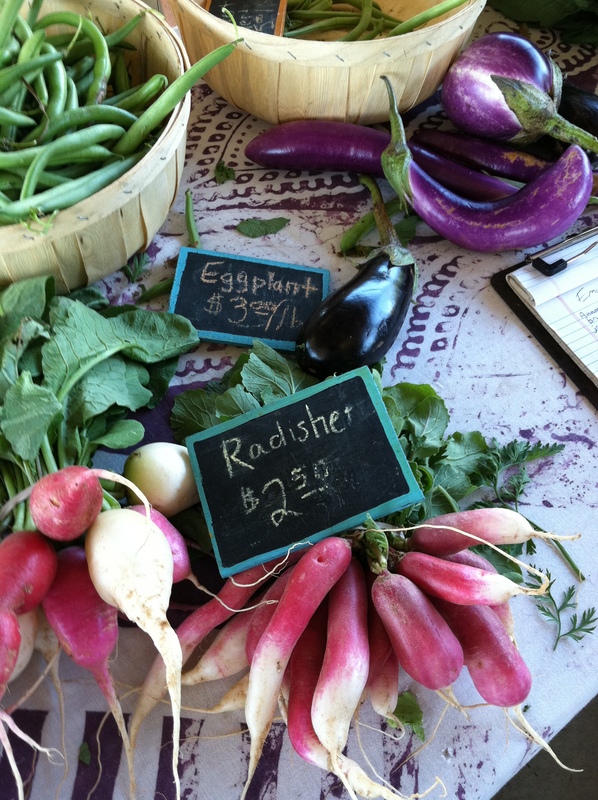 I talked to a gentleman who grew the most beautiful radishes. We spoke about the many ways to cook them and agreed the best was was to simply dip them salt and scarf them raw. His display reminded me of the markets in France in that he used these small chalk boards to write his items and prices and laid the boards amongst the leaves. I bought these radishes, YUM! There was one farmer who had a very nice hand made book he was collecting e mail addresses in. It was made from leaves and found objects and fabulous hand made paper and a small bit from a palm tree decorating the spine. The farmers were excited about the fall growing season. After a hot summer, they are glad for more hospitable growing conditions. Hopefully, as long as the frosts don’t come, there will be lots of bounty to come. There were organic chickens, eggs, beef, lamb, pork, goat (sold out), quail, Cornish hens, bacon, country hams, sausages and more. I looked for Arcana chicken eggs but didn’t see any. These eggs are naturally laid colors: pink, green, blue, yellow with bright orange yolks. Either the hens aren’t laying or they sold out early. I brought home an arm load of goodies. 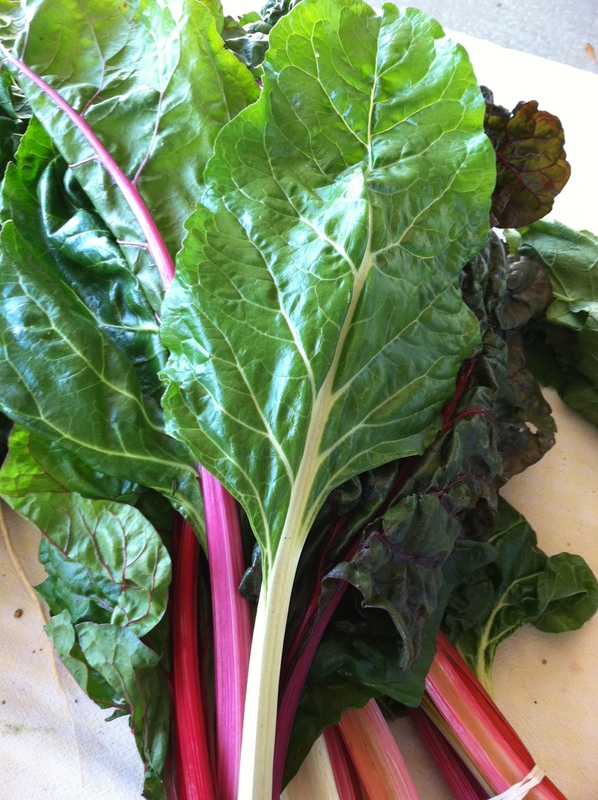 We had to cook the chard because it was too big to fit into the refrigerator. For dinner we grilled an organic chicken, sweet onions, peaches with thyme and honey, sauteed Swiss rainbow chard, Virginia’s corn relish (so good! ), Lundberg Farms Brown Rice Medley, grilled French bread with olive oil and rosemary. I think I need to stretch my belly. Here are some pictures I took today. If you haven’t been to a farmers market lately, go. These people are the heart of our country, they grow YOUR food! Go meet them, talk to them, learn what is in season, ask how they cook it if you don’t know how. Get on their e mail lists and they will tell you what they have an how much. Reserve what you want before it gets sold out. I do this with Cornish hens. Your food comes from somewhere other than the grocery store. Go discover where your food is grown, meet the farmers and feel good about using local and sustainable resources. Supporting local will improve local economies, but that is another post. 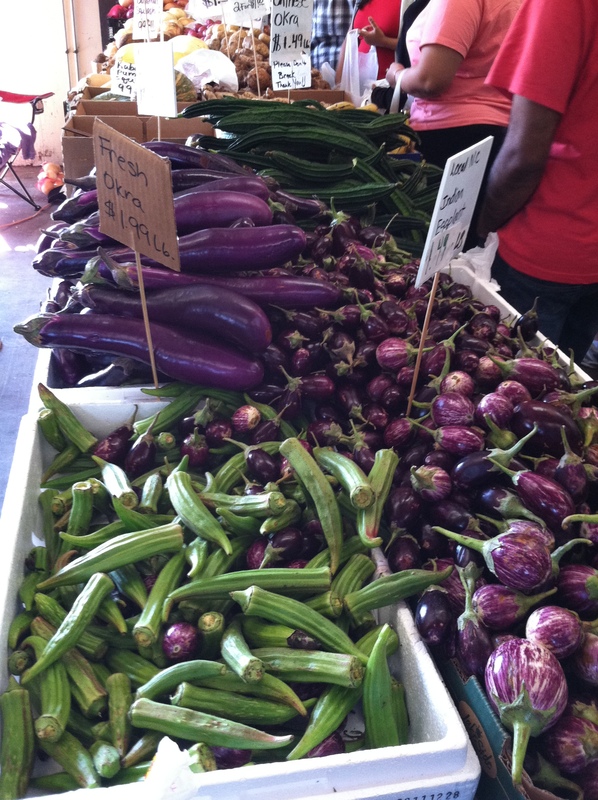 Let me know what you find at your farmer’s market! 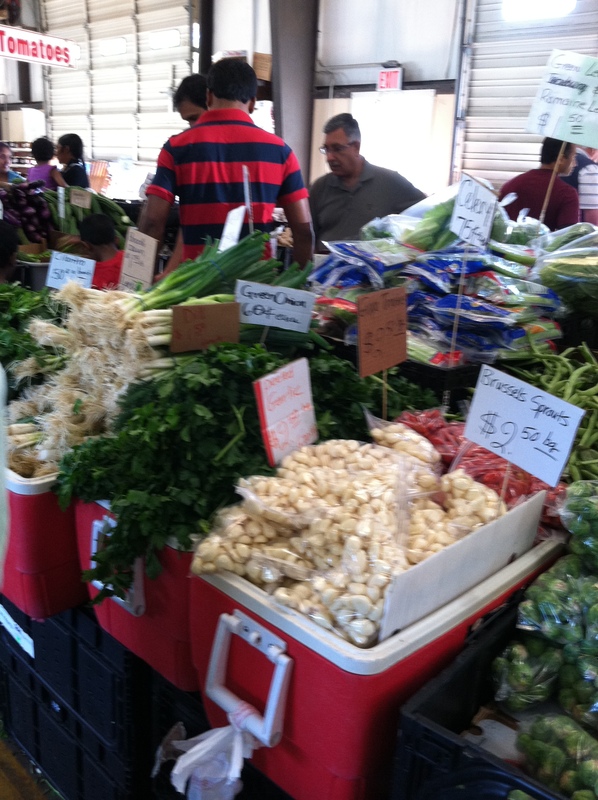 Click Farmers Market here for a listing of markets in the Charlotte area. 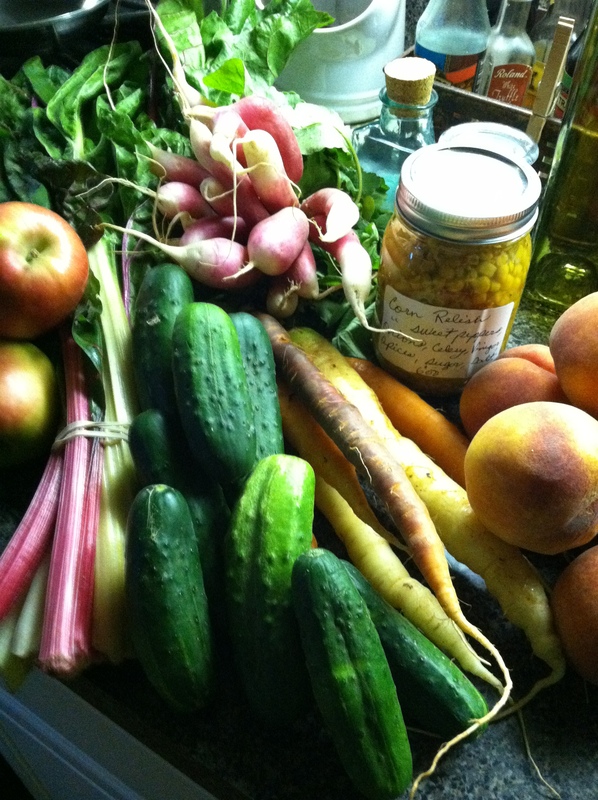 This entry was posted in The Life of a Chef, What every good cook should know and tagged corn relish, dill pickles, farmers market, grapes, growing vegetables, local, muscadine, organic, pink lady apples, radishes, scuppernong, support farmers, sustainable, who grows our food. Bookmark the permalink.